A top-notch pre-school in Chicago offers Mesha Exum and her two sons a bridge to a better life. CHICAGO––Mesha Exum wonders how her life would have turned out without a stroke of good luck 11 years ago. She was 16 with an infant son and thought she would have to drop out of school after finding baby Adonis wet, screaming and unattended at the end of his first day of day care. But a few months later, thanks to a referral from a childbirth support program she’d participated in, Exum landed a coveted spot for her son at Educare, an extended-day, year-round preschool that accepts children as young as six weeks and keeps them until kindergarten. In retrospect, it was like winning the early childhood education lottery. As President Obama pushes for a major national investment in the littlest learners, a glimpse into the power of preschool sits less than a five-minute drive from his Hyde Park home. Obama’s $75 billion proposal for universal preschool for 4-year-olds from low- and moderate-income families has been viewed as a political long shot: The funding would come from an increase in tobacco taxes, and preschools have been hard hit by the federal sequestration, indicating legislators’ willingness to cut rather than invest in early childhood education. Then on Nov. 13, a bipartisan coalition in Congress introduced legislation that would improve access to early learning programs and boost program quality. Not only would states be able to apply for money to expand pre-kindergarten for 4-year-olds, they could receive support for earlier interventions like some seen at Educare, the flagship in a national network of 19 schools. Funding details have yet to be worked out, and if passed, the legislation may ultimately represent a smaller investment than Obama originally sought. But at a time when it’s hard getting Congress to agree on anything, educators and advocates are cautiously hopeful that reforms they view as common sense may finally get their day in the spotlight. “It’s truly historic legislation,” said Diana Rauner, president of the Ounce of Prevention Fund, which runs the Educare network. Famous research by University of Chicago economist and Nobel laureate James Heckman found that every dollar invested in a high-quality early education program saves taxpayers at least $7 in social costs later. The long-term savings decline even before kindergarten, since the older a child is, the harder deficiencies are to repair. The biggest payoff comes from work with very young children because the more kids learn early, the better their school performance will be down the road. Yet Early Head Start, the federal intervention program for disadvantaged children ages birth to 3, serves just 4 percent of those whose families are economically eligible. 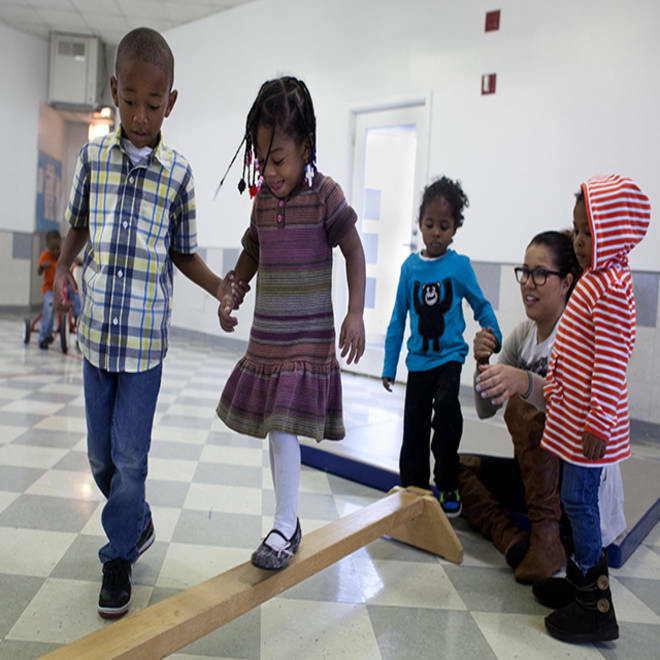 That compares with Head Start programs serving 42 percent of eligible 3- and 4-year-olds. From a full-day schedule to more stringent educational requirements for teachers to a low staff-student ratio, all of the research-based best practices being pushed in Congress and then some are on display at Educare. The school enrolls 149 children, 98 percent of them African-American and all living at or below the poverty line. It is funded through public and private dollars. With an annual budget of about $3 million, or $20,000 per child, the center isn’t likely to see mass replication of its entire program, but several specific aspects like a longer day and higher teaching standards could be adapted nationwide to help more kids. Educare’s operators seek to demonstrate––to policymakers and the public––effective strategies to stop poor children from falling behind. In doing so, it brightens their parents’ prospects as well. Exum is now 28 with a second son, 5-year-old Arimus Mosley, enrolled in his last year of preschool at Educare, which receives federal funding as an Early Head Start and Head Start site. The school provided swift assistance for speech delays in both of Exum’s boys, warding off potentially major difficulties later. Adonis Exum has tested out of speech and is on the honor roll in sixth grade at the Providence Englewood Charter School. Arimus also got extra help with social development skills, and he is poised to enter kindergarten socially and academically ahead of many of his peers. Thanks in part to support Mesha Exum received from the school, she went on to earn a high school diploma, an associate’s degree and then this year a bachelor’s in technology management. She recently enrolled in a Master of Business Administration program at DeVry University, majoring in accounting. Although she still works at a Potbelly sandwich shop and lives with her grandparents, along with her boys and their white rabbit Johnnie, she is on the road to a middle-class career. The school, coupled with Exum’s own determination, has provided the family with a bridge out of poverty. “They played a big role in continuing my education,” said Exum, who wears dark glasses and is tall and thin, as are both her boys. Through the years she has attended many parent workshops, and she currently participates in a support group for mothers, all single like she is. To give back, she serves as an elected parent representative on the school’s governing body. Rauner, of the Ounce of Prevention, considers the Educare network “a two-generation program.” A key goal is to empower parents to advocate for themselves and their children: to demand that quality continue once their kids get to elementary school and beyond, and to encourage others in their communities to do the same. “They’re learning what quality looks like––and that they deserve it,” said Rauner, whose husband is a Republican candidate for Illinois governor. To sustain the impact of early intervention, she and many others say, high-quality elementary and secondary schools are also necessary. Public opinion shows strong support for investing in early childhood education, a priority second only to job creation in a recent poll, and the issue has been gaining traction at state and local levels in various places. Bill de Blasio, who just won New York City’s mayoral election in a landslide, made universal pre-kindergarten a central tenet in his campaign. Yet his proposal, which would raise taxes on the wealthy, isn’t viewed as politically realistic. Beyond politics, pragmatic hurdles stand in the way of every child having access to high-quality interventions. One is a lack of parent understanding in some poor and immigrant communities about the importance of early education. There is also a shortage of qualified early childhood teachers, who are notoriously underpaid, and of school facilities suitable for tiny people. And pre-kindergarten programs are often half-day, effectively useless for many working parents. In the South Side community of Grand Boulevard, Educare grew out of the ruins of a public housing project demolished in the late 1990s. Opening in 2000, the school was an offering to displaced families. Today, it draws families from across the city, some of whom endure long commutes to get there. Exum and her family live in the southwestern part of the city. Nearby Englewood is one of Chicago’s poorest and most violent neighborhoods, but their block seems stable and well-cared for, lined with brick Historic Chicago Bungalows built circa 1940. Outside their home, a neighborhood watch group sign reminds passersby not to loiter, litter, solicit or speed. Inside, on a coffee table, Obama’s photos are framed alongside those of relatives. Each weekday morning, Exum and her sons pile into her navy Chevy Malibu no later than 7:15 a.m. They pass boarded-up houses, churches and auto parts stores on their 15-minute drive to Adonis’s charter school. Adonis has thrived there, but he is a quiet boy, and Exum is unsure whether the highly disciplined environment will be right for the more outgoing Arimus. 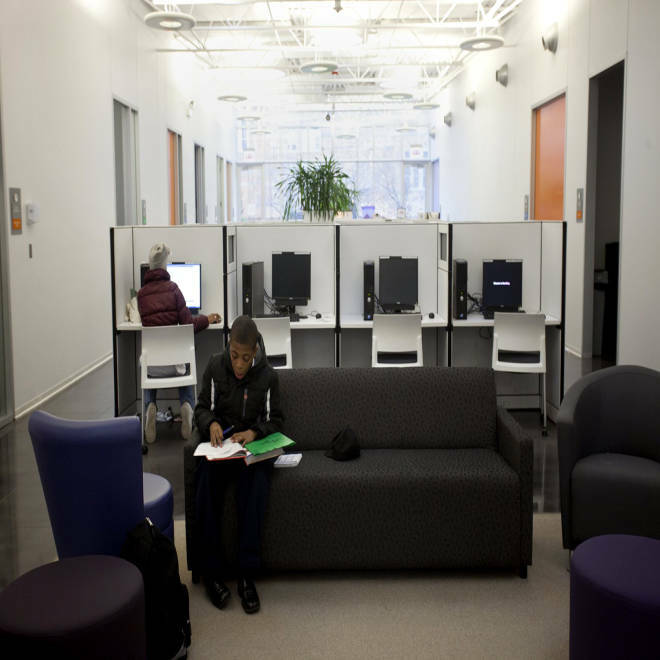 Another option is a University of Chicago-run public school that many Educare graduates attend. Another 20 minutes later, on a recent rainy and windy Wednesday, Exum carries Arimus, in a green puffy coat and Jake the Pirate backpack, into a bright white and light blue building with an enclosed playground. Educare’s modern facilities stand out on an otherwise dilapidated street. At 7:50 a.m., Arimus is the fourth child of 16 to arrive in room 106. Educare is open from 7 a.m. to 6 p.m., with teaching assistants and aides for each room on staggered shifts and children coming and going according to their families’ schedules. Learning is disguised as fun, with student choice guiding activities from dress-up to Play-Doh to an in-class sandbox, Arimus’s favorite. The class has collectively been studying clothes––types, shapes, colors, textures––based on the children’s fascination with putting them on and taking them off. There is plenty of time for eating, teeth-brushing, napping and using the miniature toilets. While Arimus listens to “The Little Engine That Could,” Exum is on her way to work. She normally returns for him around 3:30 p.m., though on Wednesdays he stays in class late during her mothers’ support group while his big brother does homework in Educare’s parent center. The family spends time together in the evening, with bedtime for the boys by 9. Then Exum begins her own schoolwork, done mostly online. These days she can usually get to bed by midnight, a luxury compared with the months when she was finishing her bachelor’s and often stayed up until 3 or 4 a.m. She’s up again before 6 to get her sons ready for a new day.